Representatives of the Broker and Asset Management Company "Wells" held the presentation of the textbook "Basic Trade Course" for Guram Tavartkiladze Tbilisi Teaching University Business Administration Faculty, Business and Social Sciences students. 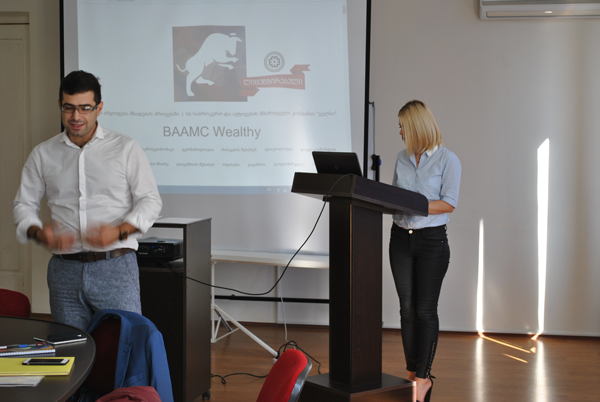 The presentation was led by "Wells" founder and trader Dimitri Sukiasov. During the meeting with students, the focus was on topics such as stock market structure and the main participants; Trade orders and their varieties; Trade psychology, Main Functions and Terms of the Use of Trading Platform - "PPRO 8"; Stock Indexes and their comparisons, Futures, Liquidity Concepts, Trading Strategies and other Basic Principles.